Our goal was to connect people across the UC campuses. Say you want to work on a project with people from within and beyond your own campus. ICUC is the webapp for you! ICUC is a web application that facilitates chatting via sockets. We used Socket.io, Node.JS environment, Express framework, MongoDB, and Python for a planned chat bot. The first challenge we ran into was understanding networks, specifically the sockets. After learning the relationship between clients and servers, we managed to establish a real time chat with a simple, but good working front end. Although we couldn't get the auto-scroll to work. The next challenge we ran into was creating multiple chat rooms. We laid the groundwork for creating separate chat lobbies with independent conversations, but couldn't establish our database in time. 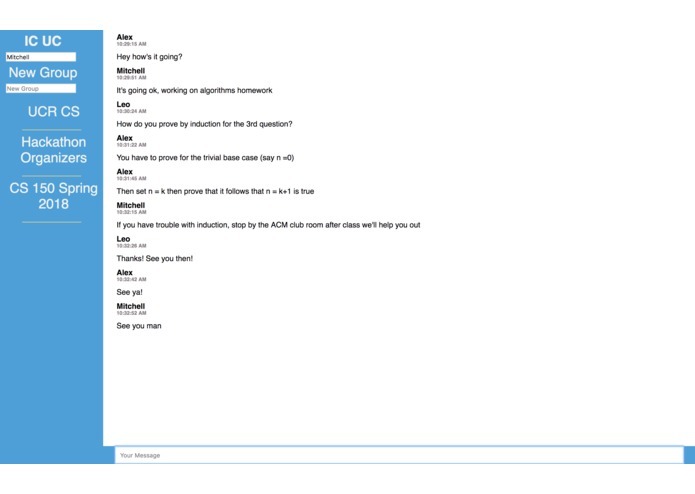 The last challenge we encountered was integrated a Python script for a chat bot into the Node chat app. We tried two NPMS: Python-JS and Pyshell modules. We did this to try to interface the user's input in the Node back end to relay as input to the Python script, then echo back the Python script's output to the client. The reason we couldn't accomplish this was because this software pipeline is very rare, and there weren't many resources to refer to. Created the chatBot that would guide the user to their desired group chat. The idea was to have the user ask questions to the bot to get a better knowledge as to what they should join / what they are looking for. The bot would learn what the user was typing and help give guidance (an attempt towards machine learning).